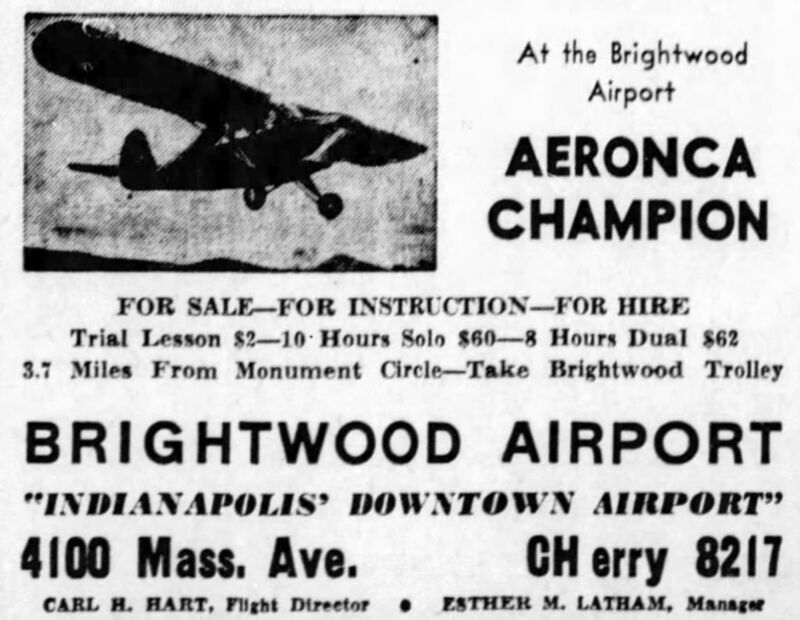 A 3/16/46 advertisement for Brightwood Airport (courtesy of Greg Brush). 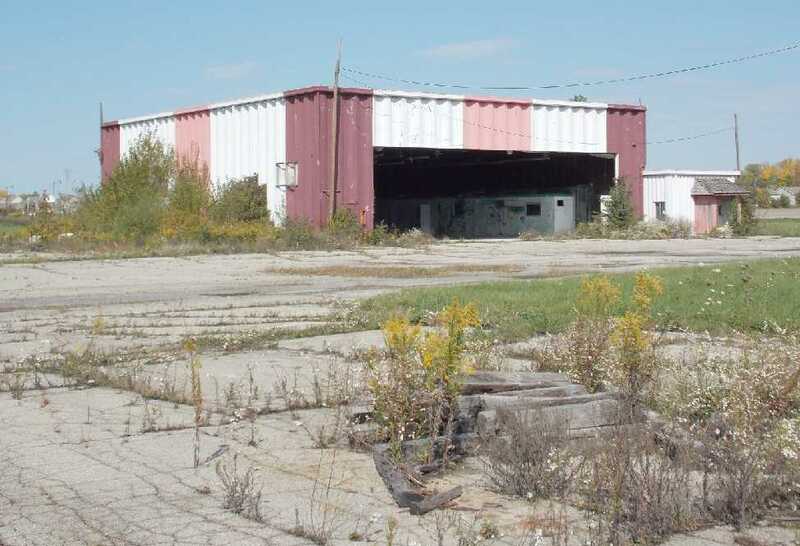 The date of establishment of this general aviation airport on the northeast side of Indianapolis has not been determined. The earliest depiction which has been located of Brightwood Airport was on the 1948 USGS topo map (courtesy of Greg Brush). 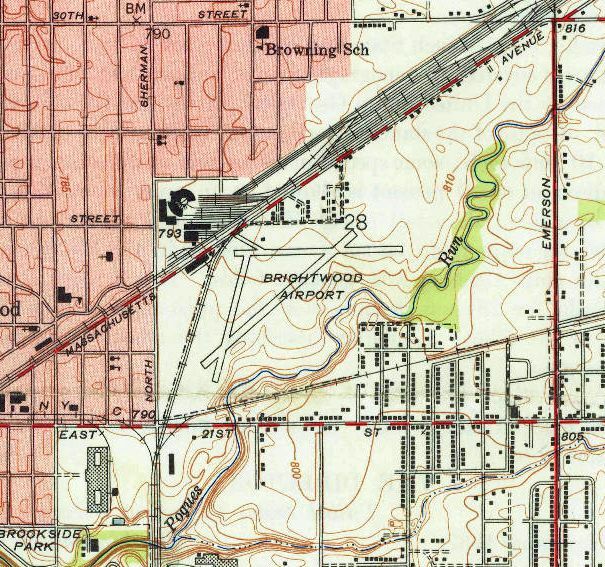 It depicted Brightwood Airport as having 3 runways & 1 small building on the northwest side. described that the Brightwood Airport property had been purchased from receivership to build a produce terminal. 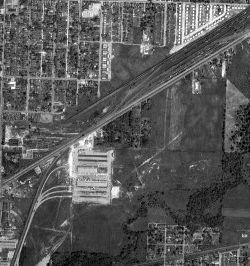 The produce terminal was eventually built on the Brightwood Airport site in 1954.
with the produce terminal covering the western portion of the airport site. 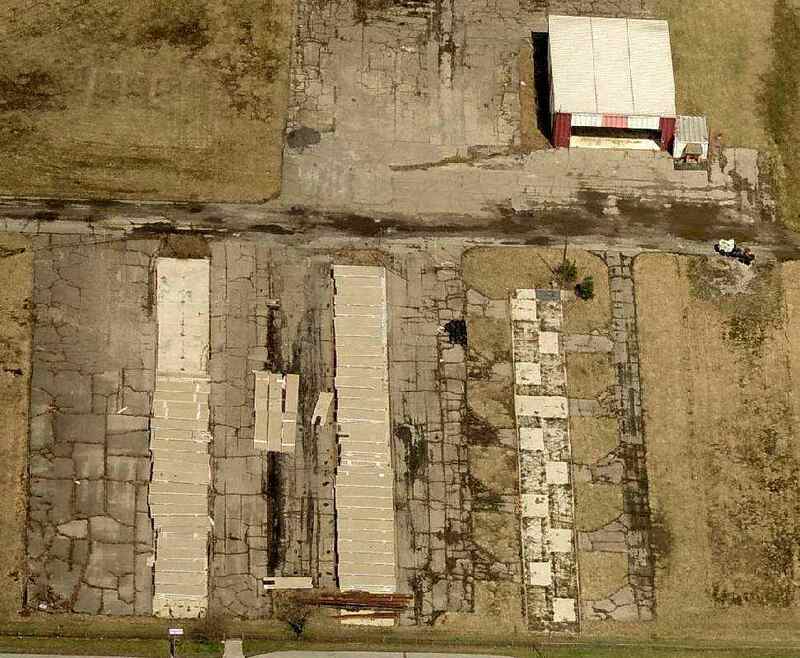 A 2016 aerial photo showed no trace remaining of Brightwood Airport. As of 2017, the Brightwood Airport site is occupied by a FedEx depot. The site of Brightwood Airport is located southeast of the intersection of North Sherman Drive & Massachusetts Avenue. Thanks to Greg Brush for pointing out this airfield. 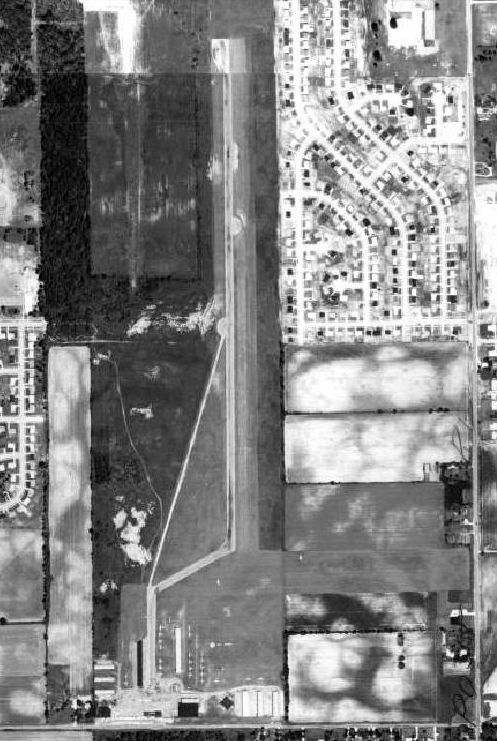 The very early stages of Eastport Airport as seen in a 1937 aerial view (from http://maps.indy.gov/MapIndy/). This little general aviation airfield was apparently quite short-lived. 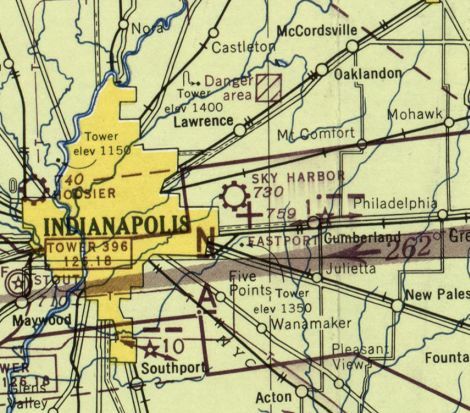 Eastport Airport was evidently established at some point between 1934-37, as it was not yet depicted on the 1934 Cincinnati Sectional Chart. 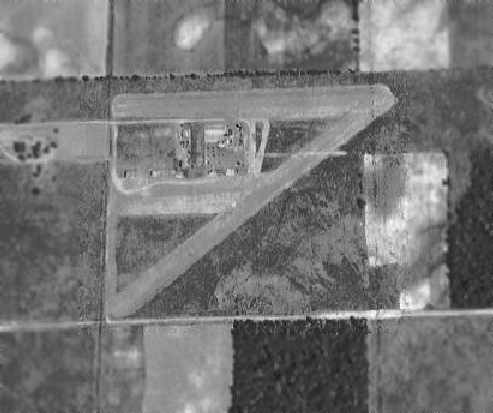 The earliest depiction of Eastport Airport which has been located was a 1937 aerial view (from http://maps.indy.gov/MapIndy/). It depicted Eastport as having 2 grass runways, oriented east/west & northeast/southwest, with several hangars in the middle. nor listed among active airports in a 1941 airport directory (according to Chris Kennedy). depicted Eastport as having 2 grass runways, oriented east/west & northeast/southwest, with several hangars in the middle. was on the April 1943 Cincinnati Sectional Chart (courtesy of Chris Kennedy). It depicted Eastport as an auxiliary airfield. It depicted Eastport as having 2 grass runways. 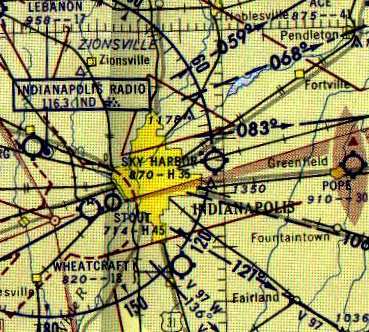 The last depiction which has been located of Eastport Airport was on the May 1945 Cincinnati Sectional Chart. It described Eastport as a 60 acre square-shaped property having 2 sod runways, the longest being the 2,200' northeast/southwest strip. The field was said to have 5 wooden hangars, the largest being a 45' x 30' structure. Eastport was described as being owned by private interests. nor depicted on the April 1946 Cincinnati Sectional Chart or the 1948 USGS topo map. but the cleared area of the northeast/southwest runway was still recognizable. erasing the last traces of the Eastport Airport. The site of Eastport Airport is located northeast of the intersection of North Post Road & East 15th Street. 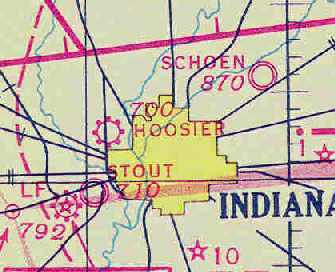 Schoen Field, as depicted on the 1931 Wagner's Map of Marion County (courtesy of Bruce Sutherlin). an infantry training base (according to the Fort Benjamin Harrison Historical Society). relocated from Kokomo to Schoen Field in 1926, before moving again to Stout Field. 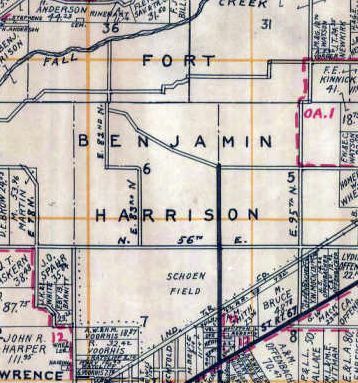 The earliest depiction which has been located of Schoen Field was on the 1931 Wagner's Map of Marion County (courtesy of Bruce Sutherlin). 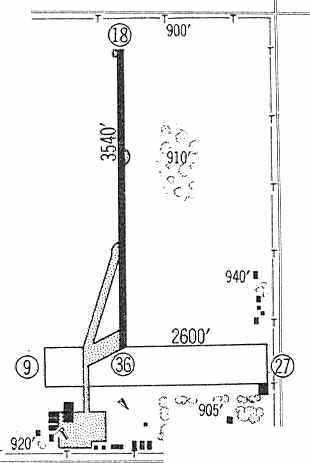 measuring 2,800' across at its widest point. The field was said to have hangars, one of which had "Schoen Field" painted on the roof. which depicted Schoen as a military airfield. A undated (circa 1930s?) photo of an unidentified Army Air Corps plane at Schoen Field. A undated (circa 1930s?) 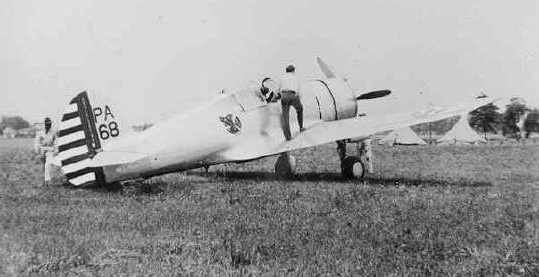 photo of an Army Air Corps Curtis P-36 Hawk fighter at Schoen Field. 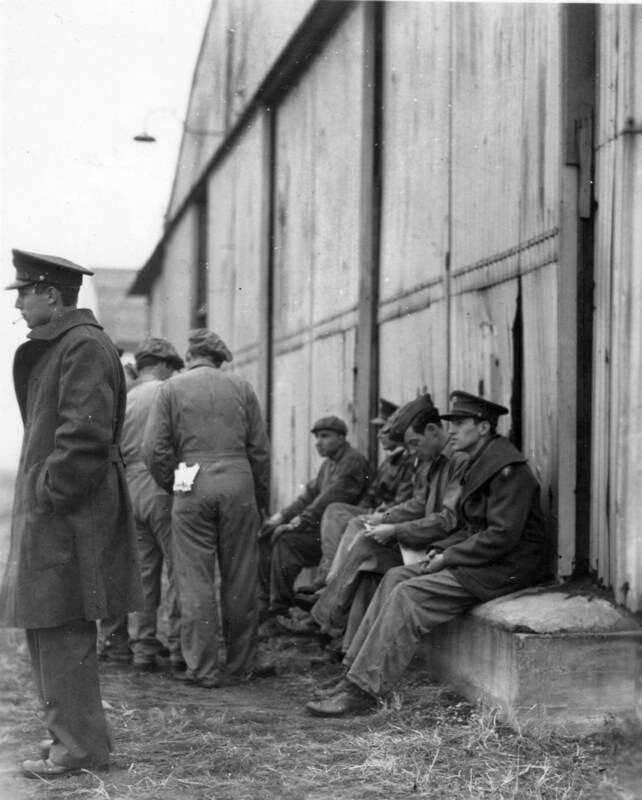 A 1939 photo of members of the 113th Observation Squadron of the 38th Aviation Division of the IN National Guard at Schoen Field (courtesy of David Parker). 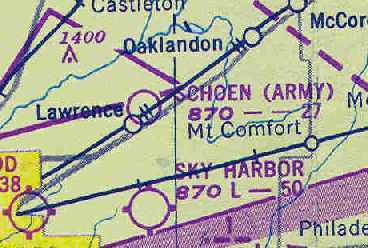 Schoen Field, as depicted on the September 1941 9M Regional Aeronautical Chart (courtesy of Chris Kennedy). A 1941 aerial view of Schoen Field, from the IN Historical Aerial Archive (courtesy of Chris Kennedy). 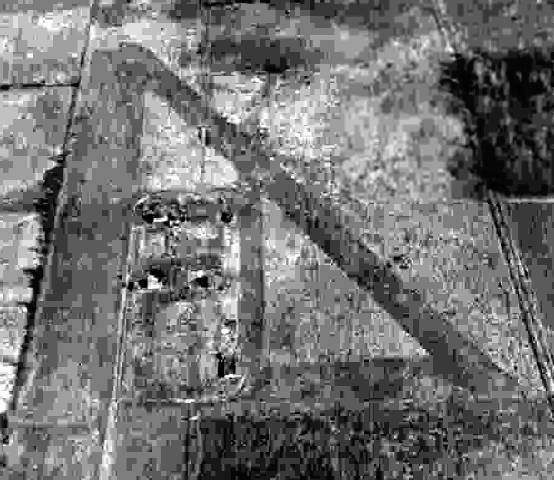 The field consisted of a pockmarked rectangular grass field, with a cluster of hangars with checkerboard roof markings on the east side of the field. It is not apparent if the field was still in use at this point, though, as there did not appear to be any aircraft on the field. as "Schoen (Army)" was once again depicted on the September 1948 Cincinnati Sectional Chart (courtesy of Chris Kennedy). 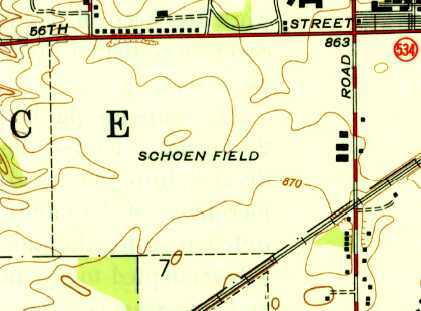 The 1948 USGS topo map depicted Schoen Field as an open area with 3 buildings along the east side. Schoen Field was evidently closed again (for reasons unknown) at some point after 1948. (according to the web site of the Fort Benjamin Harrison Historical Society, the Finance Center occupies the site of the former airfield). 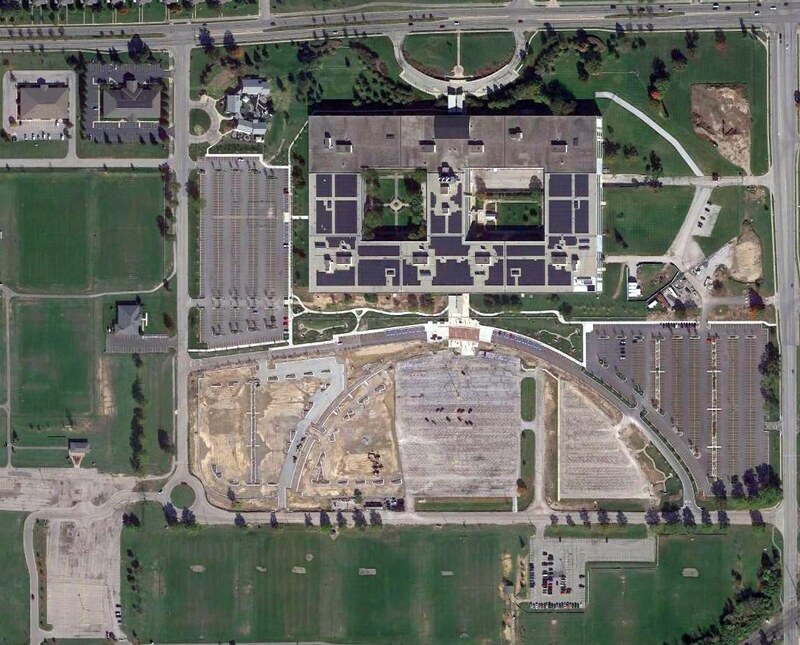 The Finance Center & its parking lots covered the site of Schoen Field by the time of a 1956 aerial photo. 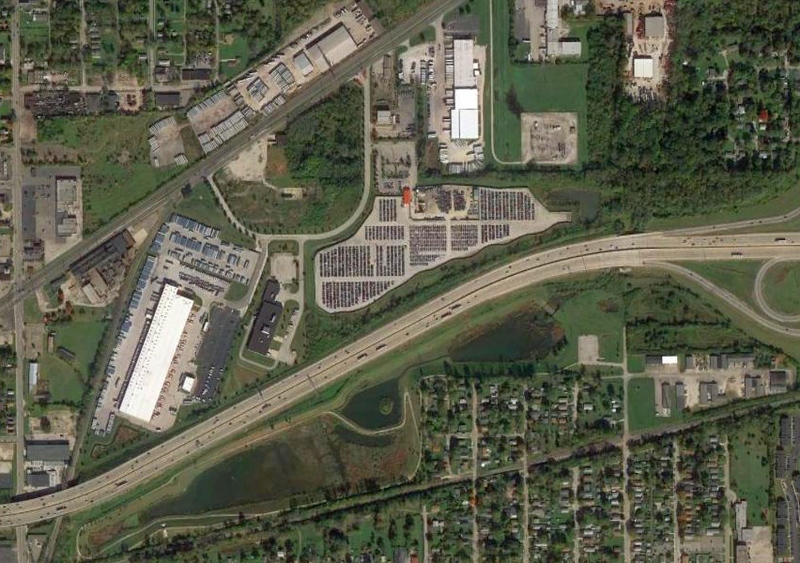 As seen in a 2016 aerial photo, the site of Schoen Field is occupied by the Fort Benjamin Harrison Finance Center, and not a trace appears to remain of the former airfield. The site of Schoen Field is located southwest of the intersection of East 56th Street & North Post Road. A postmark commemorating the 8/3/68 Grand Opening of Indianapolis Brookside Airpark (courtesy of David Parker). This is yet another suburban general aviation airport which has been lost to the pressures of development. nor on the 1963 USGS topo map or the 1966 Cincinnati Sectional Chart (according to Chris Kennedy). 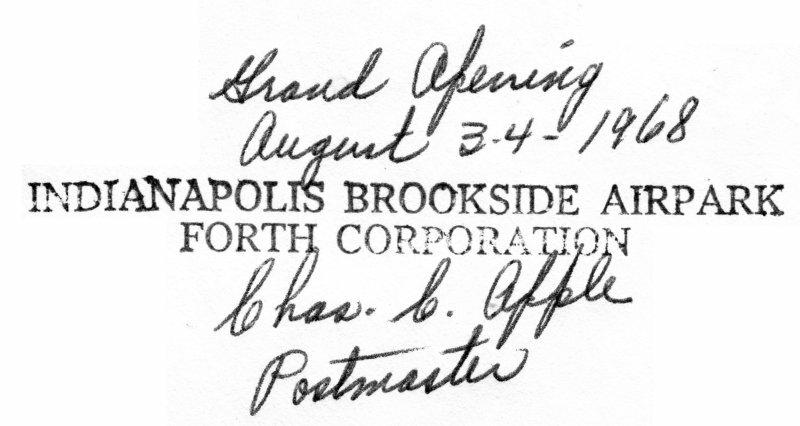 A postmark commemorated the 8/3/68 Grand Opening of Indianapolis Brookside Airpark (courtesy of David Parker). 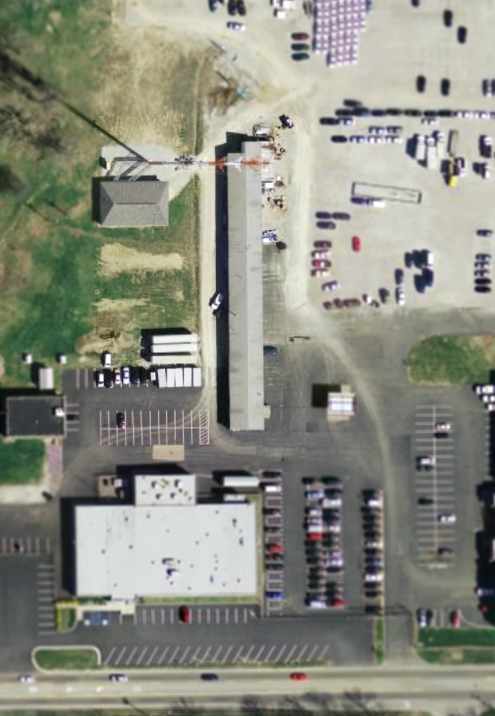 which depicted it as McCordsville Airpark. 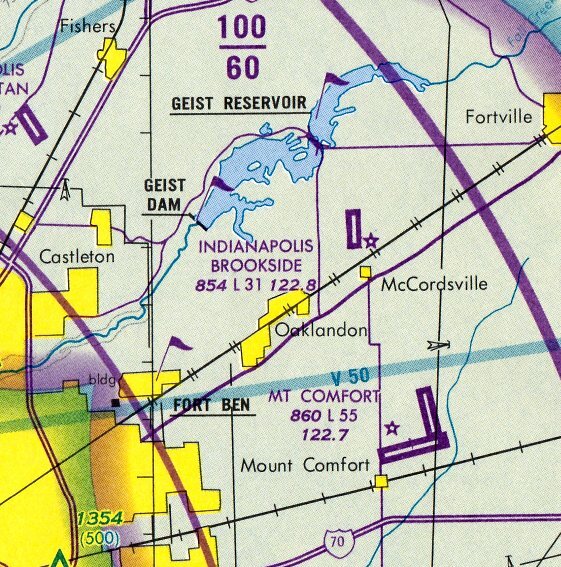 The Aerodromes table on the chart described McCordsville as having 2 runways, with the longest being a 3,100' asphalt strip. from the IN University Electronic Atlas of Central Indiana Historical Aerial Archive (courtesy of Chris Kennedy). The field was depicted to have a paved north/south runway & an unpaved northeast/southwest strip. Several hangars were located to the east of the runway intersection. as that is how it was listed in the 1971 Flight Guide (courtesy of Chris Kennedy). and a ramp on the east side of the field with 2 hangars. 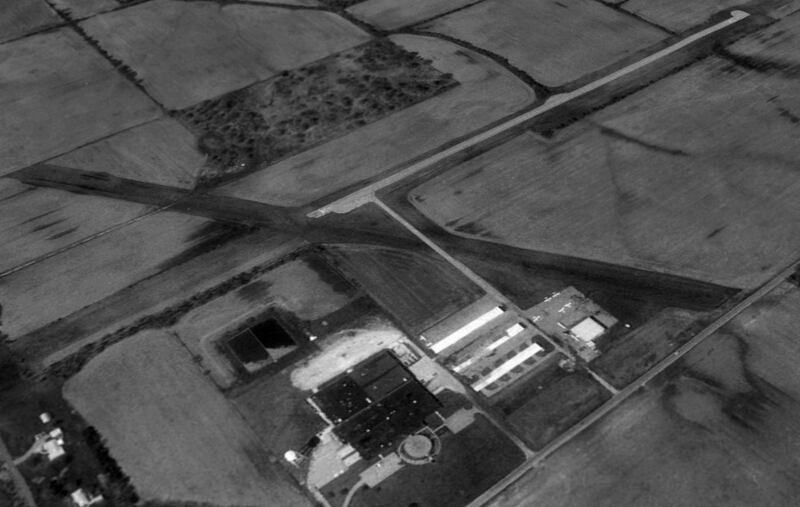 A 1971 aerial photo depicted Brookside Airpark with a total of 4 rows of T-hangars on the southeast side. 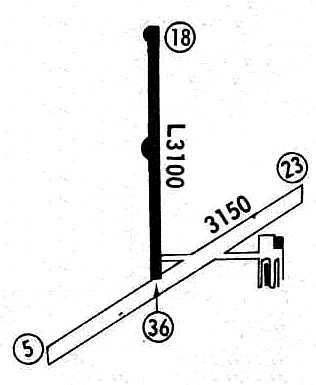 The 1980 St Louis Sectional Chart (courtesy of Ron Plante) depicted Brookside as having a 3,100' paved north/south runway. described Brookside as having a 3,100' asphalt Runway 18/36 & a 3,200' turf Runway 6/24. The operator was listed as All-American Air Service. with several buildings on the southeast side. 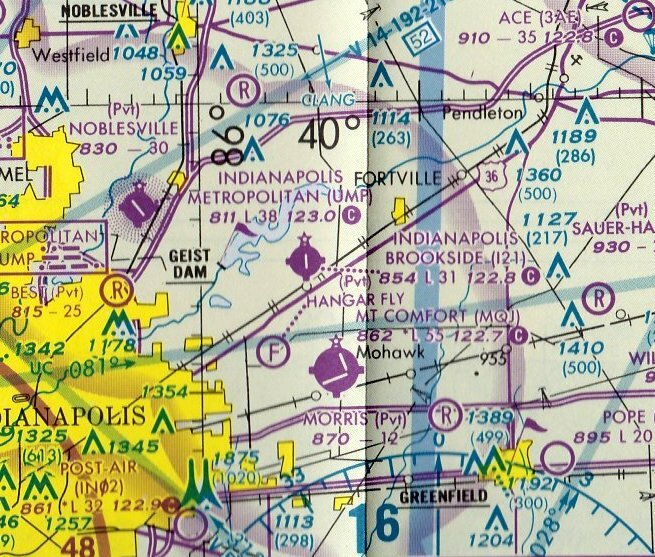 The 1984 St Louis Sectional Chart (courtesy of Ron Plante) depicted Indianapolis Brookside Airport as having a 3,100' paved north/south runway. Brookside Airpark, as depicted in the 1987 Flight Guide (courtesy of Chris Kennedy). The operator was listed as Foster Aviation. was on the May 1995 St Louis Sectional Chart (courtesy of Stu Sibitzky). It depicted Brookside as having a 3,100' paved north/south runway. 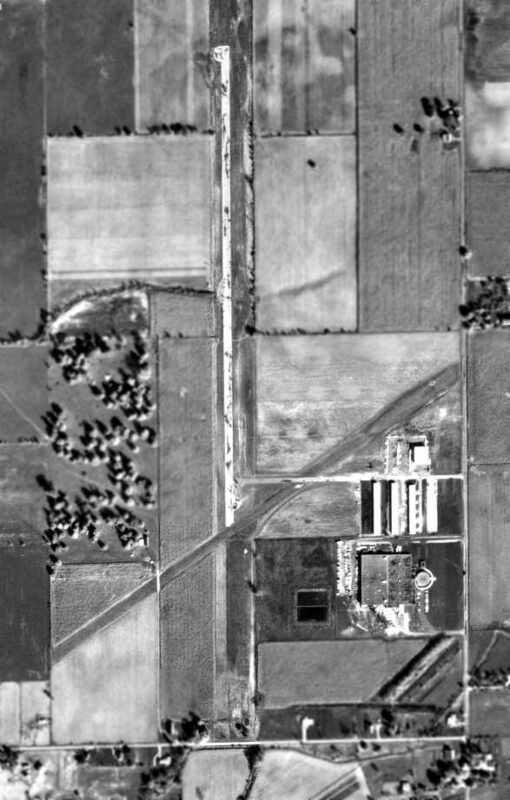 In a 1998 USGS aerial view looking northwest, Brookside Airport still appeared relatively healthy, with a total of 7 light aircraft visible on the ramp. A total of 4 hangars were also situated at the southwest side of the field. with a 3,072' asphalt Runway 18/36 & a 3,152' turf Runway 6/24. In 2003, the last published Airport/Facility Directory data for Brookside Airpark listed the owner as the Forth Corporation. A total of 37 aircraft were listed as being based at Brookside, including 3 helicopters. The field was listed as conducting an average of 33 aircraft operations per day. The operator was listed as Giest Air Services, and the airport manager was listed as Karen Farson. Brookside Airpark was closed at some point during 2003. Russ Ryle reported in 2003, “The owner died earlier this year & his kids did not want anything but the money it was worth dead. So, they sold the FBO / flight service / training facility for $$$ & have a nice big chunk of land on the market for development. 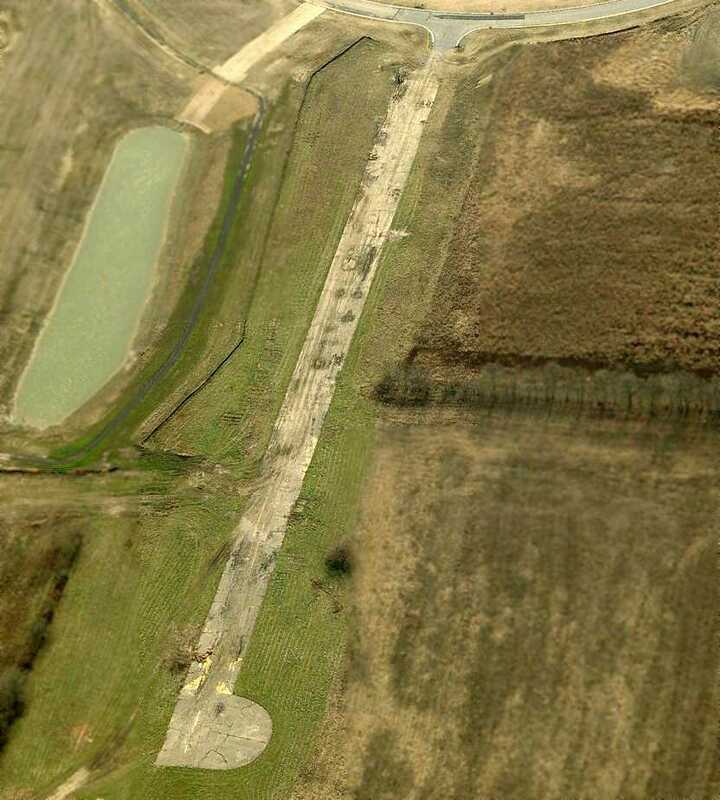 A 2003 aerial view showed Brookside Airport remaining intact, but sadly devoid of aircraft. 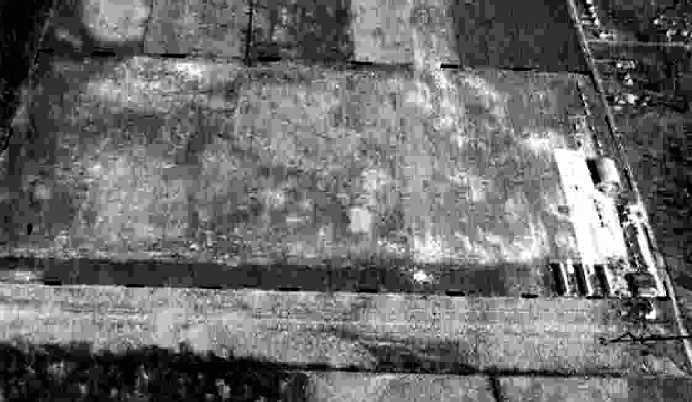 A 2004 aerial view showed Brookside Airport's runway painted with closed-runway yellow “X” symbols. 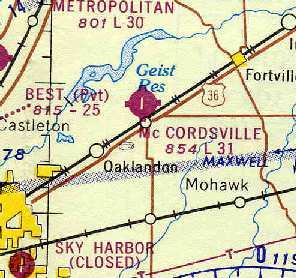 Brookside Airport was depicted as an abandoned airfield on the December 2004 St Louis Sectional Chart (courtesy of Stu Sibitzky). 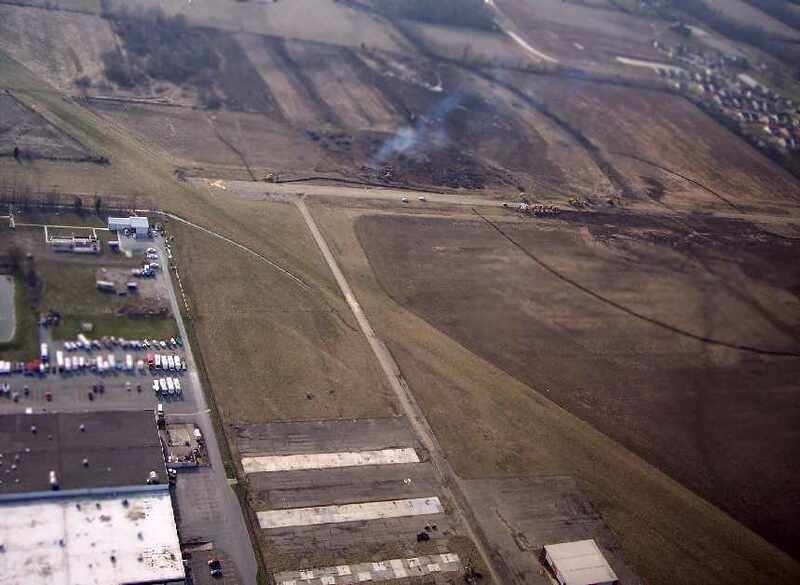 A 2006 photo by Zack Tucker, looking west at the remains of Brookside Airpark. Zack reported, “The airport has been sold off & is now going to be developed for new high-end housing. nothing of the airport will be left when the new houses are built. 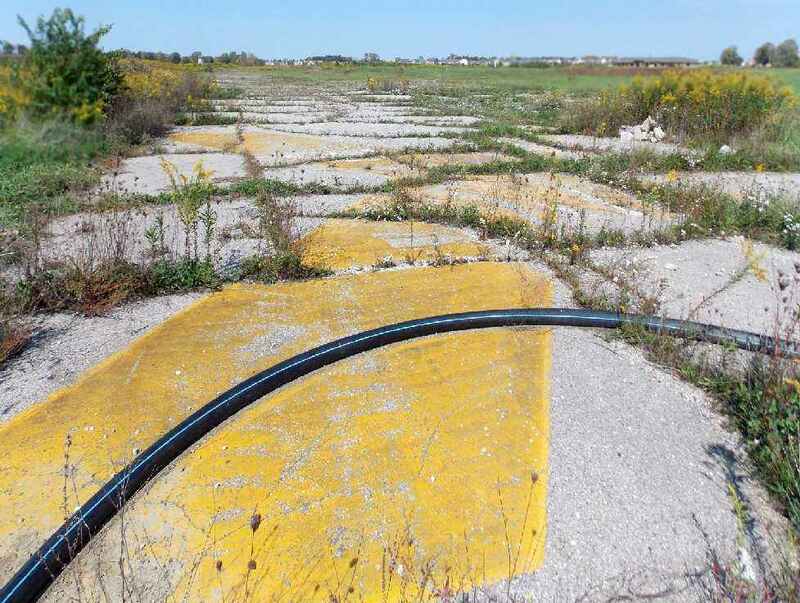 The grass runway & cement runways are both still there, but are in terrible shape. The FBO building is still there, but all of the hangars have been destroyed. 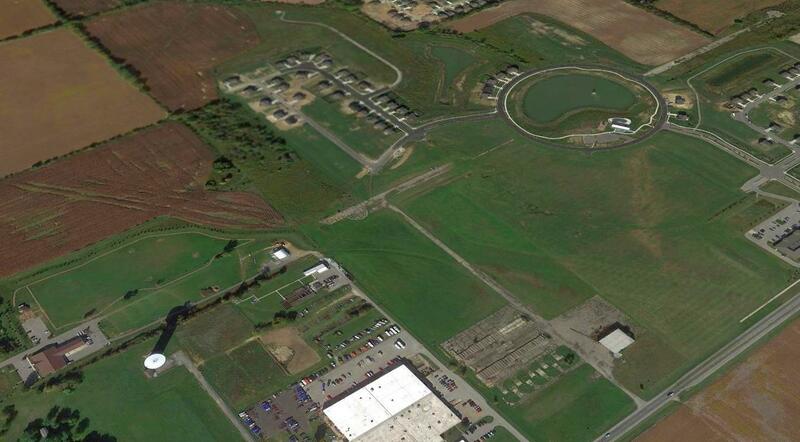 A circa 2007 aerial view looking north at the former hangar which remains standing at the site of Brookside Airpark. A circa 2007 aerial view looking south at the remains of the north end of the Brookside Airpark runway. At the top of the photo is visible the housing development streets which had covered the middle portion of the former airfield. 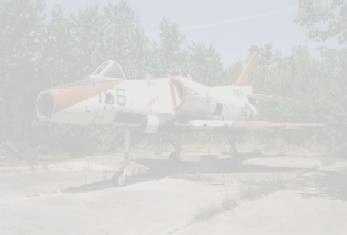 Nick Newcomb reported on 9/29/12: “Surprisingly, a lot of the airfield still remains. I went inside the hangar & the concrete is in pretty good condition, but it is full of debris & trash, there is alsograffiti all over the inside. I went inside the office building, and there are pieces of ceiling, wall paper, flooring etc scattered around. Out on the ramp, I found 2 different tires, I assume they were the tires of a single-engine aircraft because of their size. I walked down the taxiway, which, in some places, is in pretty good condition. But in other areas, it is in terrible condition. Along the taxiway, you can occasionally see the yellow taxi line, and you can also see the yellow lines that marked the location of Runway 6/24, the grass runway. Once you get to the runway, you're looking at the same kind of conditions that you will see on the taxiway. I walked down to the end, and saw the runway numbering, the X, etc. Most of the runway is in very poor condition, yet you will still find some areas that are good, considering it has not been used for more than 10 years. although construction has covered portions of the airport. 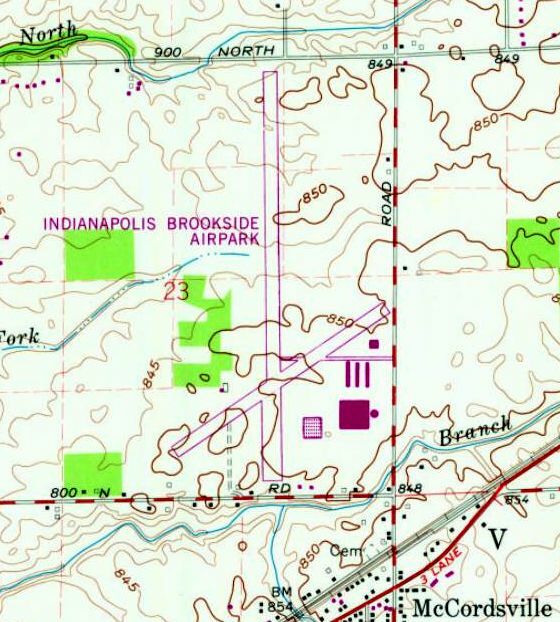 The site of Brookside Airpark is located northwest of the intersection of Route 36 & Mount Comfort Road. Thanks to Bill Griffith for pointing out this airfield. A 11/17/43 aerial view looking east at Sky Harbor Airport from the 1945 AAF Airfield Directory (courtesy of Scott Murdock). The date of construction of this general aviation airport is unknown. 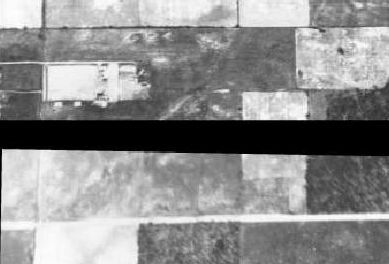 as a 1941 aerial photo of the location showed that it was still undeveloped farmland. was a 11/17/43 aerial view looking east from the 1945 AAF Airfield Directory (courtesy of Scott Murdock). It depicted Sky Harbor as having a rectangular grass airfield with several hangars & a number of light planes along the south side. was on the 1943 Cincinnati Sectional Chart (according to Chris Kennedy). 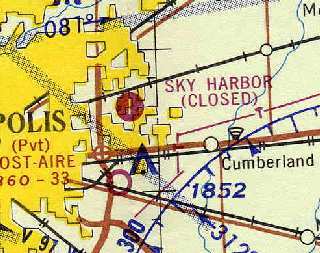 The May 1945 Cincinnati Sectional Chart depicted Sky Harbor as a commercial/municipal airport. 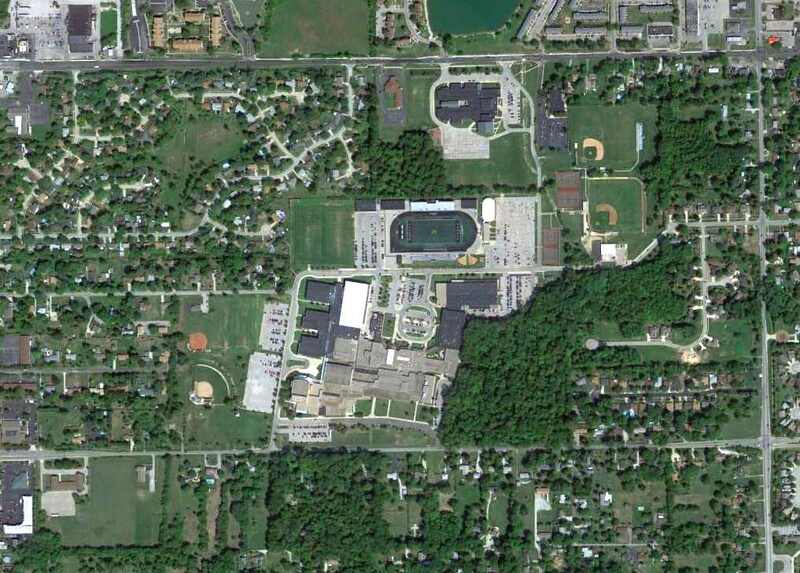 as a 90 acre irregularly-shaped property having 2 sod 2,640' runways, oriented east/west & north/south. The field was said to have 2 hangars & 18 T-hangars, and to be owned & operated by private interests. 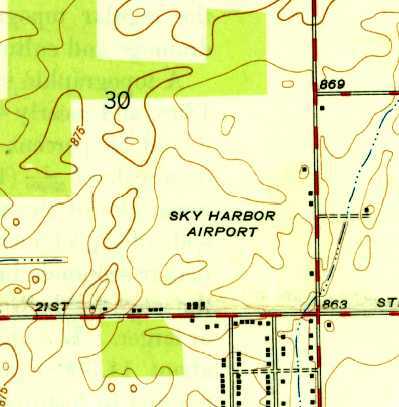 The 1948 USGS topo map depicted Sky Harbor Airport as an open area with several small buildings along the south & east sides. An 8/7/48 photo (courtesy of Dave Parker) depicted 8 light aircraft in front of a hangar at Sky Harbor Airport, including a helicopter (a rare sight at a 1940s civilian airport). Several spectators can be seen having out in front of the airport operations office, which appeared to be a former house. The 1953 Flight Chart (courtesy of Scott O'Donnell) described Sky Harbor as having a 3,500' paved runway. it appeared to have at least 6 hangars, and at least 10 aircraft were visible parked outside. depicted Sky Harbor as having a 3,540' paved Runway 18/36 as well as a 2,600' unpaved Runway 9/27. Taxiways led to a ramp on the southwest side of the field with a cluster of hangars. with taxiways leading to a ramp on the southwest side of the field with a cluster of hangars. as having a 3,540' bituminous Runway 18/36 & a 2,600' sod Runway 9/27. The operator was listed as Sky Harbor Airport, Inc. The last photo which has been located of Sky Harbor was a 1962 aerial view (from http://maps.indy.gov/MapIndy/). It depicted the field at perhaps its zenith of popularity, with 26 aircraft visible parked outside. 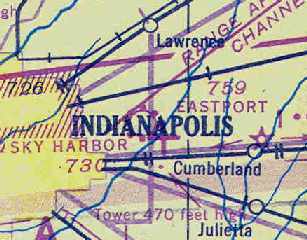 Sky Harbor was still depicted as an active airport on the 1964 Cincinnati Sectional Chart (according to Chris Kennedy). described the field as "Permanently closed". However the airport evidently remained at least in unofficial operation even after it was depicted as closed on the aeronautical charts. Harold Webb recalled, “On two occasions in the spring of 1968 I chartered aircraft for flights to Detroit... out of Sky Harbor. On the second flight we had to return because of hydraulic problems with the gear. 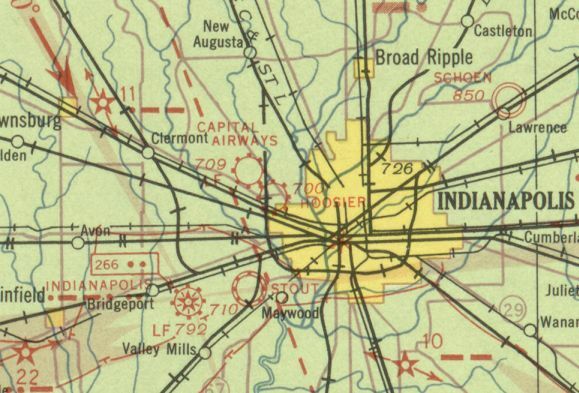 The 1970 USGS topo map no longer depicted the runway, but instead depicted Interstate 70 “under construction” bisecting the airport from east to west. Several hangars on the south side remained depicted. on the May 1971 St. Louis Sectional Chart (courtesy of Robert Brown). which was built at some point between 1968-71.
with the majority of the runway pavement north of the Interstate remaining intact. 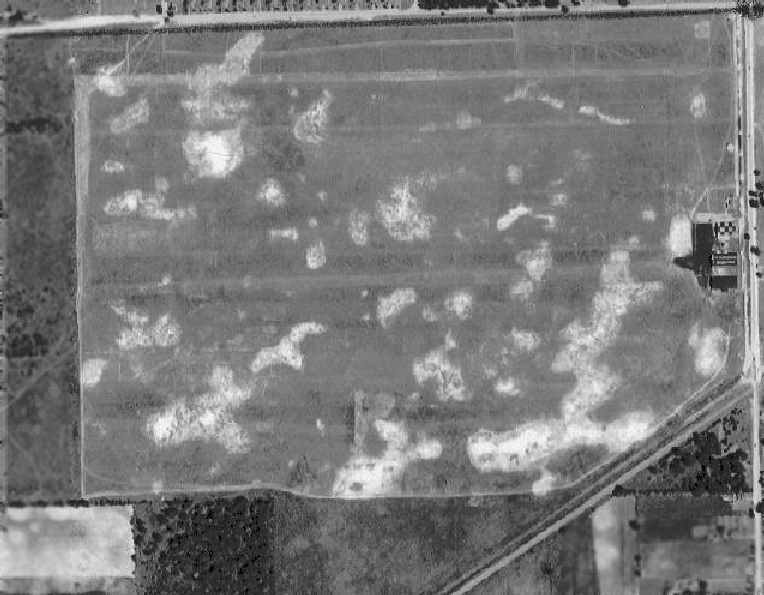 In the 1998 USGS aerial photo, the area of the former Runway 18/36 was still recognizable as a clear area running north/south in the center of the photo. However, the interstate bisected the lower end of the former runway. Harold Webb reported in 2005, “The old airport area just south of Interstate 70 is now home to the Indiana State Police. 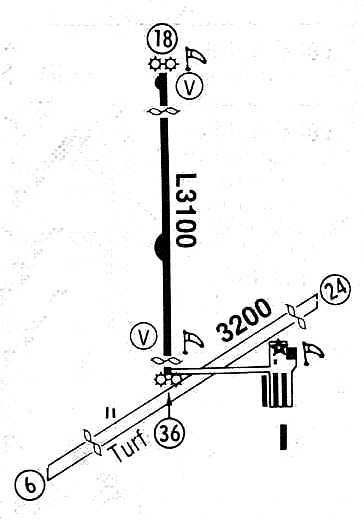 annotated by Chris Kennedy to show the outline of the former runway, taxiway, and ramp areas. showing the former Sky Harbor Airport building which remains standing at the southwest corner of the former airport property. Leroy Wheeler reported in 2006, “The site is now Post 53 of the Indiana State Police which also houses the Museum of the Indiana State Police. There are actually 2 buildings that remain from the old airport. The 1st one is the one depicted [in the photo above] at the west end, the 2nd is located about 400' east & is still on the grounds. A circa 2012 aerial view looking west at the former Sky Harbor Airport building which remains standing at the southwest corner of the former airport property. The site of Sky Harbor Airport is located east of the intersection of Interstate 70 & Interstate 465. Thanks to Jorge Rodriguez for pointing out this field.